Jumping into a existing fandom, with a humongous library can be a daunting experience. In 2013, I read my first Star Wars novel, which was Legends novel Darth Plagueis by James Luceno. I was debating between either reading the Legends novel Death Troopers by Joe Schreiber, or Darth Plagueis. I had nothing to really base my decision on, other then the cover and blurb written on the back jacket. Boy, was it an experience! 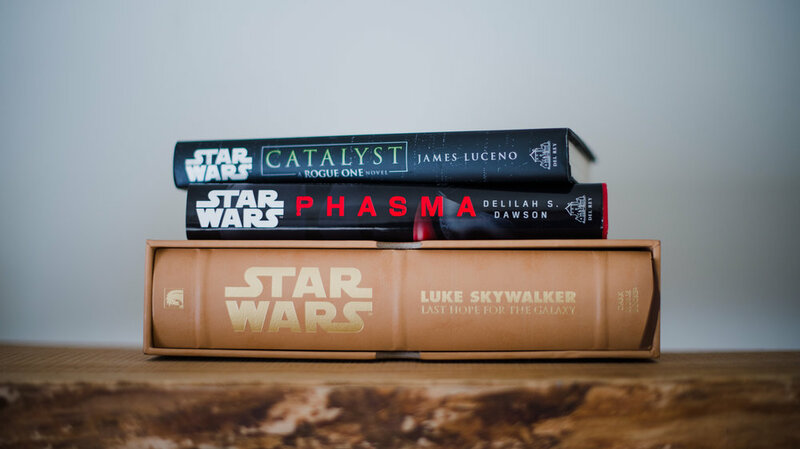 After finishing the novel, I had a new perspective to The Phantom Menace, and a desire to jump into more Star Wars novels… Except where to start? I ended up picking up novels surrounding what I knew of Star Wars at the time. I avoided Post-Return of the Jedi era (I was more focused at the prequel era during that time), as I wanted to get there eventually, after catching up on select novels set before A New Hope. I read the Darth Bane trilogy and Revan novels by Drew Karpyshyn, The Dark Lord “trilogy” (unplanned trilogy that included Labyrinth of Evil novel, Revenge of the Sith novelization, and Dark Lord: Rise of Darth Vader novel), Shatterpoint by Matthew Stover, and the Kenobi novel by James Jackson Miller. By the time I got through all those novels, the announcement came about the shift between Legends and Canon. I still read and continue to read Legends novels, as they offer so many new storytelling perspectives; however, I did shift most of my focus to all the new novels and material to release in the Canon timeline. I am currently reading select New Jedi Order novels, and have a list of random Legends novel awaiting time to get to. The four year anniversary of the first Canon Star Wars is almost upon us. In a time of retrospect, I wanted to highlight ten of my favorite canon Star Wars novels! I did limit only one novel per author (unless it is a series), or else my list would explode into a much longer list. I am sure my list may change in the future as that is what humans do, but I feel these novels would be a good jumping-in point to those interested in taking the leap into the current Canon novels. Last Shot by Daniel José Older (review): A novel that jumps back and forth in time to shape your future. Kinetic storytelling and dialogue. This Lando, Han, and THE Millenium Falcon novel jumps back and forth in time as the past informs the future, and we get to see how Lando and Han get to the crossroads they are in after the events of Return of the Jedi. What was a real treat in this storytelling approach is how the present time story (roughly a few years after the Battle of Jakku) would show the main characters saying one thing, but things are not as they appear as the backstory begins to unravel what was not said. At first I was confused why Older chose to introduce the flashbacks, when he did, until all at once the story crystalized into a giant “Oh My Stars!” moment, and kept on blazing forward until the end. *Other Star Wars stories by this author include “Born in a Storm” short story included in the From a Certain Point of View anthology novel. Lost Stars by Claudia Gray (review): A novel about finding out what you are really made of. Growing up on a recently liberated planet by the Empire, Thane Kyrell and Ciena Ree were all in to the Imperial propaganda machine. That is until a planet size explosion rips their perspective apart. This romance story does a wonderful job of drifting through moments in the original trilogy in an organic way that does not dilute the story at all. In fact, I was able to gain a deeper perspective to the original trilogy. By the end of the novel, I had invested so much into the characters and their moments of being at once together and apart in moments frozen in time. *Other Star Wars stories by this author include Bloodline novel, Leia, Princess of Alderaan novel, “Master and Apprentice” short story included in the From a Certain Point of View anthology novel, and the upcoming Master and Apprentice novel. Honestly, all of Gray’s novels would have been on this list if I had not limited myself to only one novel per author. Ahsoka by E.K. Johnston (review): A novel about finding where to go after everything has gone upside down. Set about a year after Revenge of the Sith, this novel focuses on Ahsoka’s return to her acceptance of the past. What I liked about this novel is we got to see Ahsoka Tano during her more quiet moments. Her time of reflection on what she had learned so far from her victories. From her mistakes. The mistakes of others. And how to pick herself up again to find a way to do the right thing. *Other Star Wars stories by this author include “By Whatever Sun” short story included in the From a Certain Point of View anthology novel, and the upcoming Queen’s Shadow novel. Rebel Rising by Beth Revis (review): A novel about seeing the universe without rose tinted glasses. This novel has both happy moments and crushingly sad moments to Jyn Erso. This novel focuses on the important moments between the prologue in the movie Rogue One to Jyn’s imprisonment on a work prison planet. We get a peek into some of the rebel cells that would accept and reject the future Rebel Alliance. We get to see moments of heroes and villains on both sides of justice. The stains of blood is not exclusive to only one side. *Other Star Wars stories by this author include “Fully Operational” short story included in the From a Certain Point of View anthology novel, and Forces of Destiny: Ahsoka & Padmé comic (Penciller/Colorist by Valentina Pinto and Letterer by Tom B. Long). Battlefront II: Inferno Squad by Christie Golden (review): A novel about blind loyalty, and far one will go. Syn, Meeko, Hask, and Versio make up the group Inferno Squad. Imperial agents that would go undercover to clean up problematic situations cropping up after the destruction of the first Death Star. Only how far will one go to achieve their objectives? This novel does a great job at revealing the miscommunication of two sides in a conflict. Doing what is right can change within a moment. *Other Star Wars stories by this author include “Kindred Spirits” short story, “The Bucket” short story included in the From a Certain Point of View anthology novel, Dark Disciple novel, and has written Legends stories. Battlefront: Twilight Company by Alexander Freed (review): A novel of grit and endurance in a time of unclear odds. Set around the time of A New Hope and Empire Strikes Back, this novel takes a drastically different approach to the Star Wars novels I have read to date. Part ground solder war journal throughout the course of a campaign and part fictional narrative. This novel centers around the Rebel Alliance freedom fighters from troop Twilight Company. After the destruction of the first Death Star the Rebel Alliance began a giant push against the Empire. This novel is the fallout of that decision. Added to the narrative is the mysterious Everi Chalis, who sets them on a journey of self discovery and destruction. This story does take a similar approach to jumping around on the timeline as Last Shot, which ends up working as the story progresses. When I was calendar dependant trying to map out where it all fit on the timeline, I did not sink my teeth into the story. After just letting go on where it all fit, I just had a blast, with this story. *Other Star Wars stories by this author include “Contingency Plan” short story included in the From a Certain Point of View anthology novel, Rogue One: A Star Wars Story novelization, “The End of History” short story, “One Thousand Levels Down” short story, and has written Legend stories. Aftermath trilogy by Chuck Wendig (review: Aftermath, Life Debt, Empire’s End): A trilogy of novels about showing snapshots of the embers still burning from the fight between the Empire and the Rebel Alliance. This novel took a drastically different approach to storytelling that has been talked about so much since the first book released. In a time of certain expectations this trilogy set out to tell a new story of how a group of different people came together to become Imperial Hunters, and what led to the final collapse of Palpatine’s Empire. The trilogy tells a complete story of it’s main characters, and sets in motion so many story threads that have been slowly coming to fruition (for example Last Shot was able to build upon elements of the Aftermath trilogy). *Other Star Wars stories by this author include “We Don’t Serve Their Kind Here” short story included in the From a Certain Point of View anthology novel, The Force Awakens adaptation comic (Penciller by Luke Ross, Letterer by Clayton Cowles, & Colorist by Frank Martin), and Darth Vader Annual 2: Technological Terror comic (Penciller by Leonard Kirk, Inker by Scott Hanna/Walden Wong, Letterer by Joe Caramagna, & Colorist by Nolan Woodard). A New Dawn by John Jackson Miller: A novel about realizing you do not have to live your life alone. Set about ten years before A New Hope aka about the same time as the events from the Solo: A Star Wars Story movie take place is where we are introduced to the ever complacent Kanan Jarrus. Set on an endless course of aloofness and menial jobs, his life takes a drastic shift, when he meets the direct confident and overall amazing Hera Syndulla. What I liked about this story was how it showed that life did not really change on the planet Gorse and moon Cynda on the surface, when the Empire took over. Reading this novel before being introduced to the characters in the TV show Star Wars Rebels gave me such a great starting point into caring for the show. Rebels holds a special place in my heart in Star Wars fandom. A New Dawn is also bundled in The Rise of the Empire paperback and eBook (2 novels and 3 short stories by various authors). *Other Star Wars stories by this author include “Rites” short story included in the From a Certain Point of View anthology novel, “The Ride” novella included in the Canto Bight anthology novel, "Orientation" short story, "Bottleneck" short story, and has written Legends stories. Servants of the Empire series by Jason Fry: A junior novel series that focuses on the corruption of the Empire on the planet Lothal. Each of the four novels has a central theme (teamwork, loyalty, justice, courage) that is intertwined through the focus of Zare Leonis and Merei Spanjaf, and what they do to search for Zare’s missing sister Dhara. What I liked about this series is it is not afraid to just focus on the characters and their current obstacles. For example, in the first book Edge of the Galaxy, we are introduced to Zare fine tuning his leadership skills by playing the game Grav Ball. It is not lightsabers, blasters, and suffering, but the trials him and Merei faced prepare them for the harder challenges that await. The series includes fleshing out Zare and Merei’s parents, so that they are not just one dimensional characters there to exist to just be parents. The series also does such a beautiful job of world building the planet Lothal, and we get to see more of the Grand Inquisitor, with a sneak peek into a secret project he was working on… Oh, and we got introduced to Armitage Hux’s father in this series, which alludes to the future stories in the sequel trilogy era. I am awaiting the day they announce another story about Zare Leonis and Merei Spanjaf! *Other Star Wars stories by this author include "Last Call at the Zero Angle" short story, Moving Target: A Princess Leia Adventure novel co written with Cecil Castellucci, The Weapon of a Jedi: A Luke Skywalker Adventure novel, "The Levers of Power" short story, "Duty Roster" short story included in the From a Certain Point of View anthology novel, Star Wars: The Last Jedi: Expanded Edition, and many more Legends and Canon stories. Phasma by Delilah S. Dawson (review): A novel about a surviving. Set before the events of The Force Awakens movie, this story is the origins story to how Phasma joined the First Order as told by a Resistance spy under interrogation. This novel painted the story within a story style really well, and kept me reaching for that carrot on a stick. The story is not what you will expect, and feeds you beautiful ultra-violence in spoonfuls. We also get to know a new layer to the state of the First Order, and the sassiness of Armitage Hux. *Other Star Wars stories by this author include “Scorched” short story, “The Perfect Weapon” novella, "The Secrets of Long Snoot" short story included in the From a Certain Point of View anthology novel, Forces of Destiny: Rose & Paige comic (Penciller by Nicoletta Baldari, & Colorist by Matthew Wilson), and multiple stories in Star Wars Adventures comics. If the these ten Canon novels were food, it would would be a varied buffet of different styles of storytelling. I like how different each one is, and what they bring to the overall narrative that is Star Wars. I know I have missed so many other great Canon novels that have released, and will probably shift them into my favorite list again as I go back to read them. Have you read any of these novels, or plan to? Let us know on @UnmistakablySW! Here’s to another bountiful four years! Plus, all the Legends novels awaiting for me to discover (I’m looking at you Luke Skywalker and the Shadows of Mindor novel).